Reusable Versus Disposable Nappies: Which One Is Better? 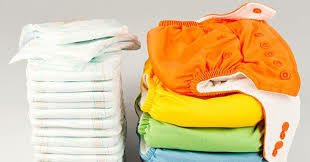 Did you know that an average baby consumes 6,000 disposable nappies before they are potty-trained? Which means it could cost each family over £600 per year. Then, by the time a child turns two-and-a-half years old, £250 worth of nappy kit is added to your priorities, since you have to buy some baby wipes, some nappy bins, and more. Not only that, by using disposable nappies, you are adding another half a tonne of carbon dioxide from the 1.21 million of tonnes of nappy dirt that the UK dumps each year to the landfills. Can delay the toddler’s toilet training because of nappy dependency. So, why settle for disposable nappies, if you can get good results with reusable ones? In a study done for the reusable nappy information service, any parents who are willing to convert their disposable nappies with reusable will save more than Â£150 per month for nappies. And to add more to it, below are its several advantages that you need to know. With cloth nappies, you will find the baby’s poo contained, unlike the disposables. If you would notice, some of the unreliable disposable nappies would loosen its grip after one to two hours of use, making the “poo” and “pee” leak. However, by using cloth nappies, you will seldom experience such situation, since cloth or reusable nappies are real snugger fit than the disposable. Are you aware that most disposable nappies are made with chemical compounds? In fact, according to several studies, frequent use of disposable diapers on babies is at high risk of having asthma, cancer, hormone disruption, and more, because of the dioxin, dyes, sodium polyacrylate, phthalates, fragrances, and more, which is one of the reasons why some of the known brands were recalled because of the discovered chemicals found in disposable diapers. However, by using reusable nappies vs disposable nappies, you are guaranteed that your baby is in good hands. Most of the reusable nappies are breathable which is essential for the baby’s comfort. Additionally, wearing cloth nappies is less scratchy than the disposable nappies. Although it is a fact that buying reusable nappies is costly for onetime purchase and washing the cloth can be daunting, it is still a fact that by using reusable diapers are far much better than using disposable ones.